Viburnum are upright, multi-stemmed shrubs that mature into a small tree. 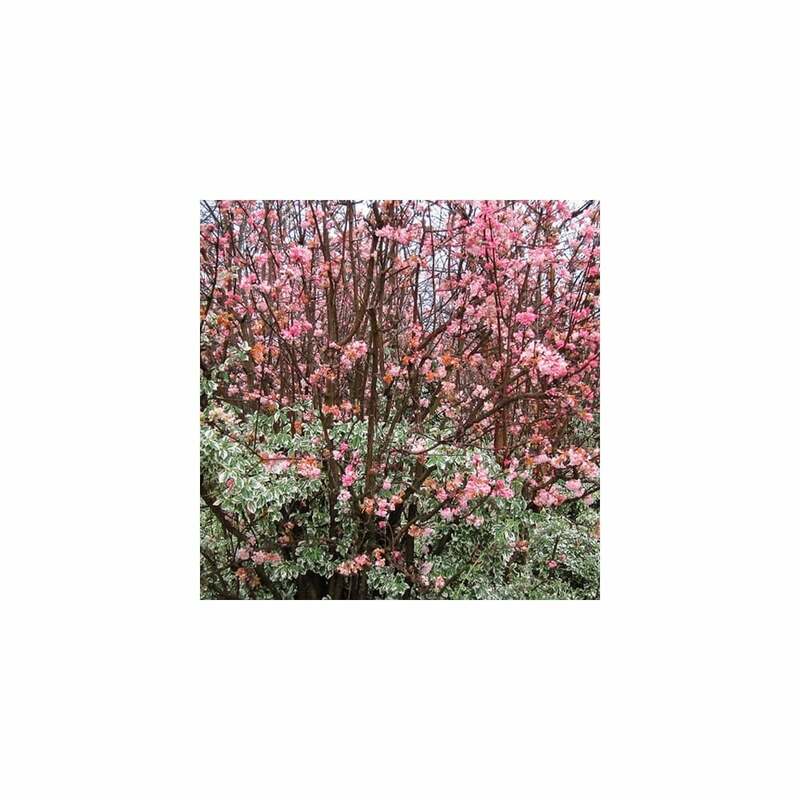 Bodnantense Dawn is an excellent Viburnum with sweet scented flowers and foliage that carries multi-seasonal interest. This beautiful winter flowering plant boasts dense clusters of deliciously perfumed flowers on bare stems from November to March. It creates a spectacular display of colours that will stun any garden visitor. Viburnum Dawn carries a long multi-seasonal interest that makes it a recommended plant in winter gardens. It produces dense clusters of fragrant tubular flowers, white and pink in colour, on woody stems. It can bloom early if the winters are milder. Ovate leaves with bronze tint in spring will enrich the plant and shows brilliant shades of burgundy-red in autumn. Its flowers will give way to purple round berries that will mature to black in autumn but are toxic if eaten. Viburnum Dawn is straightforward in growth. Plant it in full sun or partial shade in a moderately fertile soil that is regularly drained. Water the young plants regularly until they establish but avoid clogging of the soil. Viburnum will brighten up your garden in the darkest of winter. These are hardy winter shrubs that will sustain winter frost. Add a generous mulch of well-rotted garden compost around the base to retain moisture in summer. Viburnum will bloom more impressively when planted in full sun. Where does Viburnum find its place in the garden? Of course, near the entrance or walking paths, where you can enjoy the sweet fragrance of its flowers. Use them as tall hedges outdoors or in large containers for indoor use. Viburnum Dawn is ideal for cottage gardens, scented gardens and cut flower gardens. We will endeavour to dispatch your goods on the same day your order is placed if it is received before 7 am (Mon-Fri). If your order is received over a weekend it will be dispatched on Monday. We only ship to the United Kingdom. Our free postage is available on all orders regardless of total price. © 2019 Gardeners Dream. All Rights Reserved.